A true California delight, this incredible golf vacation includes a stay and play at 3 of California's most beautiful locations: Pebble Beach / San Diego / Palm Springs. Ideal during any time of year, this tour will test your game, and delight your senses as you travel down the beautiful California Coast and into the vast Desert. At Pebble Beach resort you will have a chance to play where the pros play while being pampered at the Pebble Beach Lodge or Inn at Spanish Bay. From here travel down the coast with a stop at San Simeon - another breathtaking ocean town. Now its on to San Diego (America's coastal paradise) to stay and play at some of Southern California's best courses like Aviara and Torrey Pines. Lastly your tour will conclude with a stay in the California desert at Palm Springs - America's golf capital of the West. Here you will test your game on yet again a selection of PGA Calibre courses from PGA West Stadium to Indian Wells Golf Resort. Day 1: Arrive San Francisco or Monterery California. Transfer to Pebble Beach Golf Resort. Check into Pebble Beach Resort Lodge or Inn at Spanish Bay for 3 nights. Afternoon round at the Links at Spanish Bay. Day 2: Play Spyglass Hill Golf Club. Afternoon/Evening at leisure enjoying the amazing ocean views. 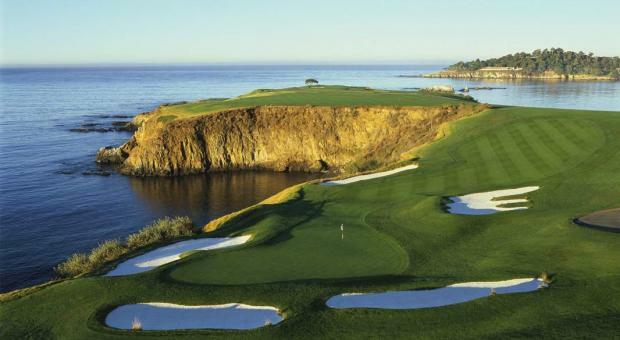 Day 3: Play the famous Pebble Beach Golf Links. Afternoon/Evening at leisure enjoying the amazing locale sightseeing or enjoying the superb resort amenities. Day 4: Transfer to San Simeon. Check into the Pelican Inn and Suites (Cambria). Stay 1 night. Take a tour to Hearst Castle or enjoy evening at leisure. Day 5: Transfer to San Diego (optional stop in at Santa Barbara for added nights). Check into Hyatt Park Aviara Resort and Spa. Stay 4 nights. Day 6: Play Aviara Golf Club. Afternoon and evening sightseeing and at leisure. Day 7: Play La Costa Golf Club Champions or Legends courses. Afternoon or evening visit San Diego attractions or at leisure. Day 8: Play Torrey Pines South Course (home of the PGA Tour and host course of the US Open). Evening at leisure. Day 9: Transfer to Palm Springs. Check into the Hyatt Regency Indian Wells Resort and Spa. Stay 4 nights. Day 10: Play Indian Wells Celebrity Course. Evening at leisure. Day 11: Play Indian Wells Player Course. Evening at leisure. Day 12: Play Desert Willow Firecliff or PGA West Stadium. Evening at leisure. Day 13: End of Tour. Optional Add ons for Added Fee: Breakfasts at all hotels / Sightseeing opps.